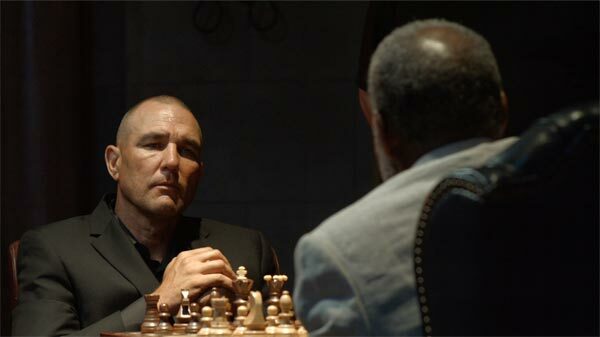 Chess can be a highly cinematic, deeply symbolic game in films like Ingmar Bergman’s The Seventh Seal, Satyajit Ray’s The Chess Players, and Norman Jewison’s The Thomas Crown Affair. In the wrong hands, it can also be shlock. Try not to think about those vastly superior films when considering this grade Z chess match-slash-hostage drama. The so-called “King’s Game” has never been dreckier than it is in Timothy Woodward Jr.’s Checkmate (trailer here), which releases today on DVD from Alchemy. Two rather supernatural looking gents are sitting down for a friendly game of chess. Although never referred to by name in the film, the credits lists one as “Elohim,” the Hebrew and Mormon name for God, and the other as “Lu,” which could be short for any number of names, like Lucille or Lulu. To sweeten the pot, Lu suggests they play for the “Deed to Eternity.” I kid you not. It is implied that a clumsy bank heist is being controlled by their chess moves, even though the standoff underway seems to have started well before the chess game. However, it is hard to judge with certainty considering how severely Woodward abuses flashbacks as a story telling device. To further complicate matters, one of the hostages is the super-pregnant asthmatic wife of one the SWAT team officers. Another hostage is poor Allen, the unemployed father of a young boy in dire need of a heart transplant. To collect on his life insurance policy, Allen contracted Father Dyson, a Roman Catholic priest who doubles as a hit man, to kill him in a manner that clearly does not look like suicide. No, I’m not making this up. Look, we dig our B movies here. We were downright bullish on the British werewolf western Blood Moon, rather indulgent regarding Isis Rising (starring Indo-American pornstar Priya Rai) and generally forgiving of other questionable Vinnie Jones vehicles like 6 Ways to Die and Age of Dragons. However, Checkmate just doesn’t have Jack Straw going on. It is a narrative jumble that looks cheap and unprofessional. For the first forty minutes or so, Woodward flails about, trying to figure out if there is anyone in his bargain basement Crash ensemble worth following for the rest of the film, but after all that exposition, he still comes up empty. Frankly, Danny Glover’s groggy demeanor as “Elohim” suggests Woodward forced him to be in the film by abducting and drugging him. If so, that is obviously problematic, but at least it absolves Glover of responsibility for this mess. Inexplicably, Sean Astin throws away all his accrued credit with Catholics from Rudy by playing the homicidal Father Dyson. Good luck explaining that decision to Saint Peter. Fans of Eddie and the Cruisers should also be warned. They do not want to see Checkmate, because the years and scripts have not been kind to Michael Paré. However, Mischa Barton shows better sense than most of her co-stars, because she spends the better part of the film trying to hide behind her inhaler. Only Jones really steps up and assumes any responsibility, deciding the only way out is way-the-heck-and-gone over the top. As “Lucille,” he gives us something to watch, but those scenes with Glover make absolutely no sense whatsoever. This is just a sad, crackheaded excuse for a film. If it were the least bit competent, the Father Dyson subplot would be rather offensive, but the plodding Checkmate’s crimes against watchability are so basic and fundamental, they do not even allow for such outrage. 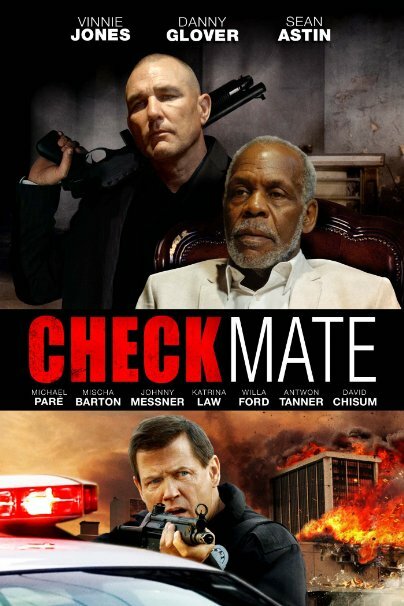 Not recommended to anyone under any circumstance, Checkmate releases today (9/8) on DVD and VOD from Alchemy.